Advent (Love): Sharing the Love | Words of Wisdom? 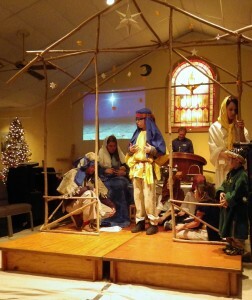 This morning, the youth of our congregation presented our annual holiday pageant. This year it was a retelling of the nativity story entitled, “Would You Like to Hold the Baby?”, written by Joyce Poley. This version of the story – told through drama and song – emphasizes the themes of Love and acceptance that are at the heart of the original telling, but are often lost amidst the “hallelujah”. It asks us to consider whether we would have the courage to journey across a vast distance, in search of a love greater than we had ever known, with nothing but faith to guide us. It asks us to search our souls for awareness of the gifts that we bring to the world, and to set aside our own fears and sorrows and share them. In this re-framing of the myth, over the objections of those around him, Joseph welcomes all who approach, and offers them entry into the little stable to see his newborn son. No one – be they shepherd or king – is turned away. During a week when much of the nation is embroiled in a polarizing debate over the judgmental words of a reality television “star”, this message of love and inclusion is a timely one, and one that bears repeating. Again, and again, and again; until it is heard, felt, and embraced. The question, “Would you like to hold the baby?”, reminds us that the baby – and what he symbolizes – belongs to everyone. That everyone – young or old, rich or poor, straight or gay, native or foreign – is welcome in the manger; that everyone is worthy of sharing the love and joy that Christmas brings. This entry was posted in Advent, Love and tagged awareness, Bible, faith, gifts, Love, Unitarian Universalist. Bookmark the permalink.